Have you discovered the cozy mystery novel yet? They are most often set in small local towns and feature amateur detectives who investigate local murders and disappearances, most often as a sideline to their day job . The murders are pretty much bloodless, and generally happen off-page, the love interest mostly hinted at, quite the antithesis of the dark gritty psychological thriller. These well written, intelligent, often humorous and engaging stories are a refreshing read and provide a welcome break from the harsh realities of the modern world. Intellectual whodunits, they are utterly perfect to loose yourself in for a few hours. 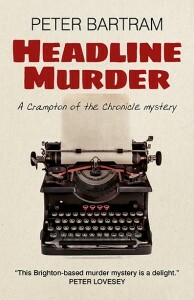 A wonderful example of the cozy mystery genre is written by author Peter Bartram, whose Crampton Chronicles feature COLIN CRAMPTON, ace crime reporter on the Evening Chronicle and are set in Brighton in the swinging sixties. 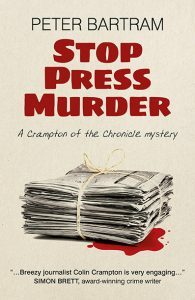 Headline Murder and Stop Press Murder both follow the adventures of Crampton as he races to uncover the truth, and they'll keep you guessing - and smiling - to the last page. We are delighted to announce that the next Crampton Chronicle, Front Page Murder, will be published by Roundfire Books in November 2017. So now is the perfect time to get yourself acquainted with Brighton's super sleuth, Colin Crampton, and his earlier adventures ahead of the next thrilling escapade in the Crampton Chronicle series.